Well, to be quite honest with you all, this is one of the challenges that I was dreading to complete. The reason for this is because I’m struggling with believing this dream will ever come true. Part of my disbelief is due to the fact that I can’t make this dream come true by myself; someone else has to choose this dream with me. See, my dream is to be a wife and mother. Always has been. Always will be. I wish I could say that something else was more – or at least as – important to me. I almost convinced myself to blog about something else and pretend I had a different dream. I mean, I do have another dream that is important to me: To do private child care out of my home and eventually expand into my own child care center. But as awesome as that would be, it pales in comparison to the joys of finding my eternal companion and raising children together. Time really isn’t on my side with this. But even when I “give up” on this, there is always a glimmer of hope that never seems to fade away. So there it is. It’s really difficult to blog about this so I’ll get back to the actual challenge now. I have a picture of the LDS temple in West Jordan, UT. When I went through the temple for my first time, it was in this temple. I don’t care which temple I actually get married in. They’re all beautiful. This picture is going up on my wall in my bedroom so I’ll see it every day. 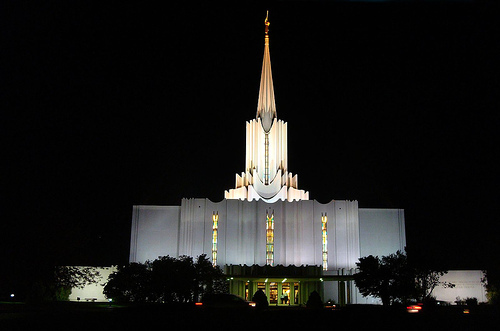 I’m lucky that I live in Utah and drive past temples all the time. And I also get to go to the temple as often as I wish, which is a beautiful blessing in my life. So I’ll keep this reminder and hope for the best. I’m trying to look forward to that future day with child-like anticipation and hope. I know, Yoda said “Try not. Do or do not. There is no try.” So let’s just say I’m working on doing, since for a while I’ve been doing not. Children don’t worry. Children don’t doubt. They just believe. I want to be like that. I pray for the courage to “becometh as a child”. Posted in Mental Health, Uncategorized and tagged adultitis, inspiration, mental health. Bookmark the permalink. Cheers to you for having the courage to post this. My prayer is that your dream comes true! Nothing is impossible for God. Thanks so much! Don’t worry, I won’t compromise!